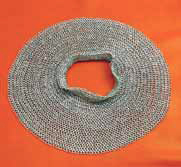 This collar of chain mail was also known as a camail or aventail. These drapes of chain were attached to the base of a helmet, sometimes covering the face, to provide flexible protection for the neck. Originally, they were riveted to the helm; this illustration shows a later form of attachment, where the camail has been laced on as opposed to riveted. 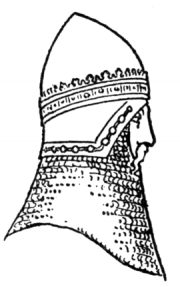 Prior to the early 1300's, the camail or collar was generally attached to the edge of the helmet by riveting. Gradually a method of attachment that allowed for easier repair came into use, attaching vervelles to the edge, and then lacing the chain drape to the holes in these staple-like pieces. This allowed easier removal of the drape for repair or use on another helmet. This photo is just one of many examples in which a knight's effigy shows him wearing full armor. His helmet has been fitted with a camail. This page was last modified on 16 November 2014, at 14:09.